When I saw How to Draw Fantasy Art and RPG Maps pop up as today's Deal of the Day I was intrigued. I've never heard of the book before, but for 6 bucks (normally $12) I think I need it. Besides, it comes in epub and mobi - so all of my ebook readers are covered - sadly no PDF. 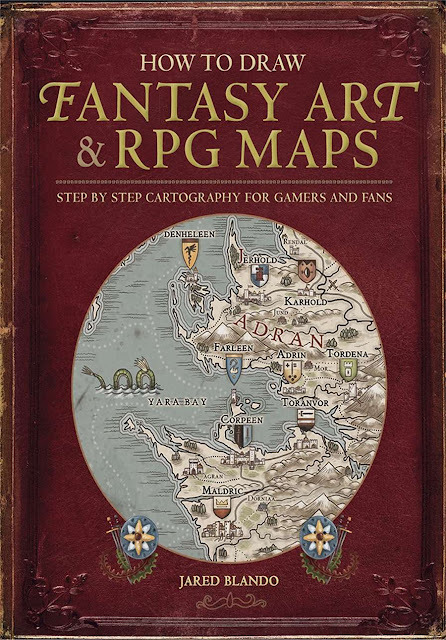 This book will teach you to bring your fictional realm to life with simple step-by-step instructions on how to draw authentic fantasy maps. Set the stage for adventure by illustrating domains, castles and battle lines, mountains, forests and sea monsters! Learn to create completely unique and fully functional RPG maps time and time again on which your world can unfold. All the skills necessary to create awe-inspiring maps are covered! Landscapes. Add depth, balance and plausibility with rocky coastlines, towering mountains, dark forests and rolling plains. Iconography. Mark important places--towns and cities, fortresses and bridges--with symbolic iconography for easy-to-understand maps. Typography. Learn how to place readable text and the basics of decorative script. Bonus instruction teaches you to create fonts for Orcs, Elves, Vikings and dragons. Heraldry and shield design. Depict cultural and political boundaries with shields and colors. Advanced cartography. Includes how to draw landmarks, country boundaries and political lines. Build roads to connect merchants and troops, troll cairns and dragon lairs. And complete your maps with creative backgrounds, elaborate compasses and thematic legends. 30+ step-by-step demonstrations illustrate how to construct an entire fantasy world map from start to finish--both digitally and by hand! Yep, affiliate links keep The Tavern open. That's an affiliate link above. meanwhile in the fasntasy 'real world' charcoal from the fire and a piece of old canvas are what maps 'really' look like. And drawing is an evolved skill so don't expect accuracy or scale from people without drawing as a specific skill.